Service and therapy animals have become increasingly popular for children with special needs, and for good reason. Research shows that animals can make a huge difference in kids' physical independence and emotional well-being. What's more, service and therapy animals are being trained to help a very wide range of people with many different disabilities, in many settings. What Are Service, Emotional Support, and Therapy Animals? Service, emotional support, and therapy animals are trained differently, perform different tasks, and have access to public places at different levels. According to the Service Animal Association, "a service dog works to help the owner perform tasks he cannot perform on his own because of his disability, an emotional support animal works to improve the health of his owner who is disabled, and the therapy animal works with his owner to improve the health of others." Service Animals: The vast majority of service animals are dogs. Service dogs may guide individuals who are blind or deaf, alert others to an individual who is having a seizure, pull a wheelchair, retrieve dropped items, and otherwise perform meaningful physical services to a person with a physical disability. Service dogs are not pets; they are highly trained, and are considered to be "medical equipment." As a result, they have special legal status and may accompany their owner virtually anywhere they can fit. Emotional Support Animals : Emotional support animals may be dogs—but may also be almost any other species. They are medically prescribed by a doctor and provide support for a single disabled person. Emotional support animals are not highly trained, but they do provide significant support and comfort; as a result, they are allowed on airplanes and in "no pets allowed" hotels, restaurants, and other public facilities. Therapy Animals: Therapy animals are pets that have been trained, registered, and insured. They belong not to a disabled individual but to someone who brings the animal to facilities for therapeutic purposes. A therapy animal might visit nursing homes, hospitals, clinics, or schools to provide stress relief and comfort. Unlike service animals and emotional support animals, therapy animals are not medically required and thus can't (for example) be brought into a school without special permission. What Can an Animal Do for My Special Needs Child? Is a Service or Emotional Support Animal Right for My Special Needs Child? Is my child old enough (usually 12+) to physically and intellectually work with and (to whatever degree possible) care for an animal? Are my child's needs likely to be met by an animal? Obviously, a therapy animal is a poor choice for a child who is afraid of animals or is likely to ignore, injure, or neglect them. Is our family ready to own and care for a service or emotional support animal? Yes, there are laws to protect the animal from a landlord, but do you have space and time to own (for example) a large dog? Are you able to make a long-term commitment to an animal that may be living with you for many years? Is an animal the best tool to achieve your child's goals? For example, an emotional support dog may delight a child with autism, but it might also wind up being a substitute for (rather than a tool for improving) important human interactions. Where and how would your child work with a service or support animal? Are those settings likely to be safe and appropriate for your animal? Can Animals Come to School, Religious Services, or on Airplanes? "The ADA requires State and local government agencies, businesses, and non-profit organizations (covered entities) that provide goods or services to the public to make “reasonable modifications” in their policies, practices, or procedures when necessary to accommodate people with disabilities. The service animal rules fall under this general principle. "Accordingly, entities that have a “no pets” policy generally must modify the policy to allow service animals into their facilities." Allergies and fear of dogs are not valid reasons for denying access or refusing service to people using service animals. When a person who is allergic to dog dander and a person who uses a service animal must spend time in the same room or facility, for example, in a school classroom or at a homeless shelter, they both should be accommodated by assigning them, if possible, to different locations within the room or different rooms in the facility. Rules that pertain to service animals and most emotional support animals do not apply to pets. 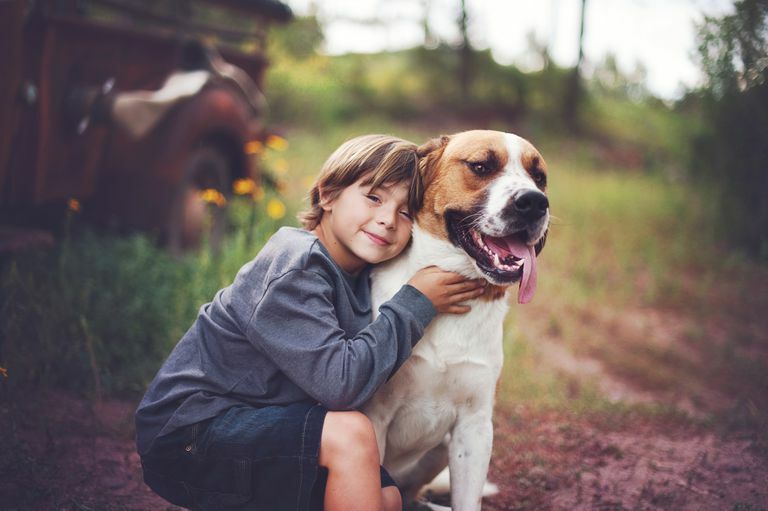 Even if your child is emotionally attached to his animal friend, he may have to leave the animal at home if you don't have the right documentation. If you want your doctor or therapist to prescribe an emotional support animal for your child with special needs, you can ask them to write an official letter explaining your child's disability and why the animal is required for his or her mental health. That letter must be provided, in advance, to airlines and other public facilities that prohibit pets. If you simply want an animal companion for your child, your best bet is to research types and breeds, have your child visit with a few potential pets, and then buy the animal that suits your needs. Such an animal, however, will not have access to public places as they are not covered by the ADA. As mentioned, you can ask your child's medical practitioner to write a letter describing your pet as an emotional support animal. If you are interested in a trained service animal, you're in for a very different experience. Service animals are expensive because they are highly trained. In addition, your child will only be given a service animal if he or she is trained and capable of interacting properly with the animal. You may even have to submit to a home inspection to be sure you own a suitable home for the animal. Cerebralpalsy.org. Service Animals. Web. 2017. Purewal, R et al. Companion Animals and Child/Adolescent Development: A Systematic Review of the Evidence. Ed. Paul B. Tchounwou. International Journal of Environmental Research and Public Health 14.3 (2017): 234. PMC. Web. 30 May 2017. Service Animal Association. What Are the Differences Between a Service Dog, an Emotional Support Animal, and a Therapy Dog? Web. 2017. U.S. Department of Justice. Frequently Asked Questions About Service Dogs and the ADA. Web. 2015. Wrightslaw. Can the School Refuse to Allow a Service Dog? Web. 2015. Does In-School Suspension Impact Special-Needs Students?